Have a wonderful Wednesday everybody ! Белый просто сногсшибательно смотрится на тебе Вероника! You look always really classy! Love this blazer…and I loooove your shoes! This is the perfect look to me – love how you added the leopard pumps and the contrast detail on this blazer is so chic! i love that this look is so simple but very chic at the same time! great pumps! The jacket and blouse could be serious if not paired with this distressed jeans which balanced the whole look.. clever pairing and that shoes adds character! Perfect! I just found you rblog and I love it! The fit of the jeans is superb and I so love how you paired it with the white blazer thus creating a lesson in minimal chic with edgy details. An elegant outfit, I like it! LOVE your blazer so much!!! you look gorgeous as always! I adore the mix of crappy jeans and lady blazer. Cool! Love thie outfit! !cool jacket and bag!! Such a chic and stylish outfit, it feels like you’re in the French Riviera! Wearing the new shoes I see! LOVE! It’s a great look, very stylish. Love your blazer and bag. Perfect sunglasses. amazing minimalistic look! I always like the combo of leopard shoes and blue denim. 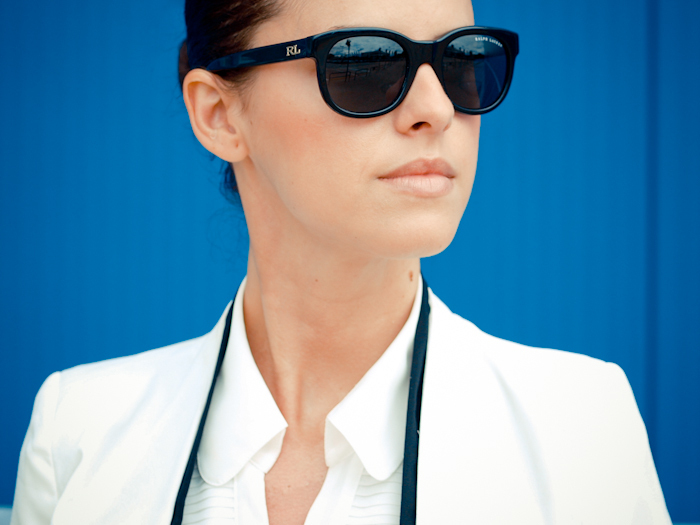 Your cat eye sunnies are divine! I can’t stop looking at you, you look SENSATIONAL today! 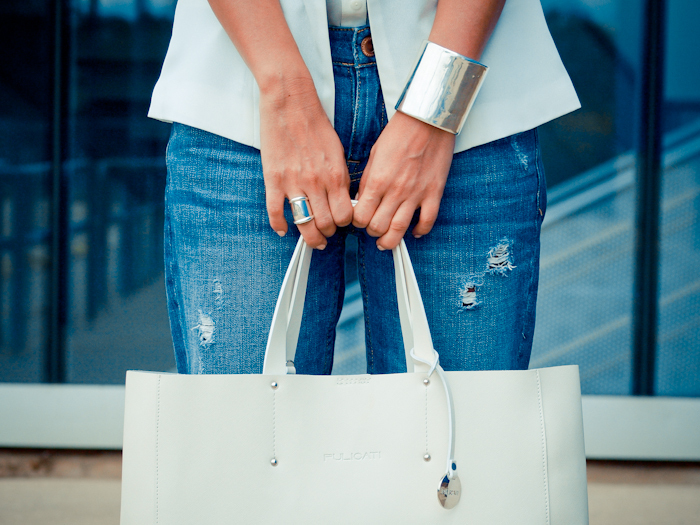 White is your color, the cut of that blazer is amazing and the jean is perfect!!!! MY FAVOURITE!!!!! you look beautiful;)love your jacket.very chic style! Love the heels, great look!!! How are you??? Gorgeous look! And the hair style is perfect for this outfit! Love this look! You look great! I love this look! The boyfriend jeans are so cute and the blazer is perfect with it! So ‘clean & chic’! Veronica, you look absolutely beautiful! wow! you look stunning! 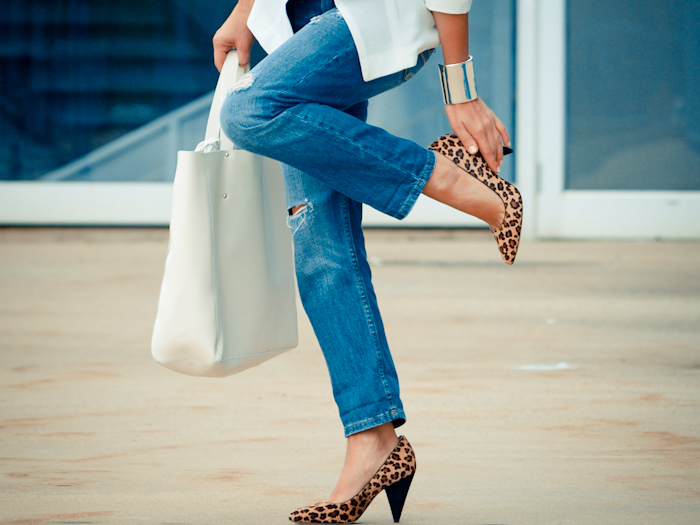 love the blazer and the leopard heels! love it all! 10 for the combination!